Like the mix in cuisine they are, hybrid dishes bring about mixed results in Korea with many often falling in the atrocious level. While results of such fusion places can be mixed at best, I was pleasantly surprised by a visit to one joint which combines Korean/Italian flavors that turned out unexpectedly well. Bbongshin is a chain of stores which calls itself a "fusion jjambbong cafe". Jjambbong, as most will know, is the counterpart and rival of another Korean favorite, jjajangmyun. 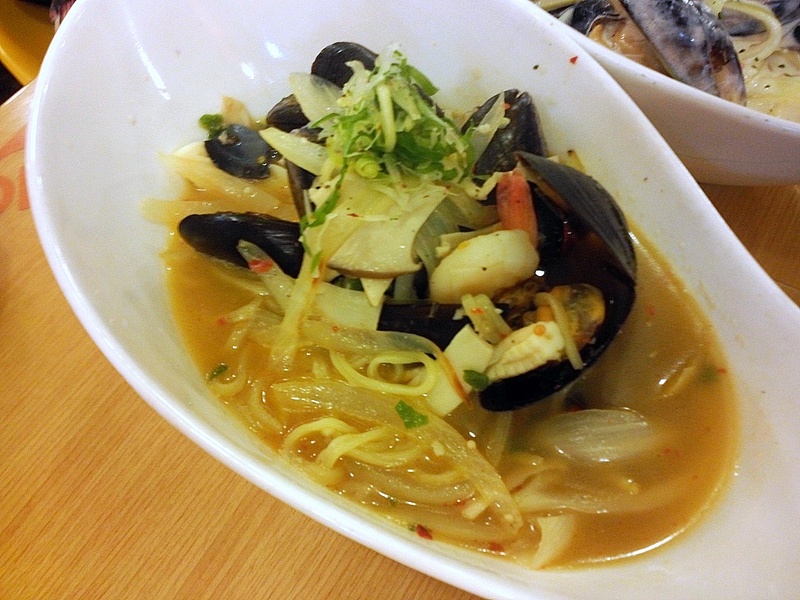 Jjambbong is usually made in a spicy seafood and red pepper based broth and is a staple of any Korean-Chinese joints. At Bbongshin, the jjambongs go besides the usual fiery red broths to include broths that are tomato sauce and cream sauce based. Also adding to Bbongshin's draw is their made-to-order thin pizzas. The concept of Bbongshin isn't actually new. There's a rival establishment in Korea with a similar concept and menu offerings called Nibbong Naebbong and I think I've seen/heard a few other places too. They're all popular with the teens to twenties demographics and as such, they're usually located around all the young hotspots (Hongdae, Konkuk University, Gangnam, etc). Bbongshin's interior is simple and casual with tables and chairs laid out to maximum output on the floor. Couples and friends will make up most of the crowd, making it a boisterous and lively environment. What's particularly noticeable, however, is the open kitchen which shows the busy kitchen staff firing up jjambbong ingredients in woks over open flames or kneading and rolling out dough for the pizzas. Such open kitchen systems aren't unique for eateries a bit higher up on the fancy scale than Bbongshin of course but I was still surprised to see such transparency for a low-mid chain eatery in Korea and it helped give Bbongshin a much reputable and trustworthy image right off the bat. - Mabbong. Your standard seafood jjambbong with a generous inclusion of garlic (hence the "ma" in the dish's name from the Korean word for garlic, "maneul"
- Kokebbong. A tomato sauce based broth jjambong which has a slightly spicy and sweet taste. - Baekbbong. A cream based broth jjambong. - Darling. A gorgonzola cheese pizza with a sweet sauce offered on the side for dipping. - Bbongmark. A tomato sauce and cheese pizza with bacon and an egg cooked on top. 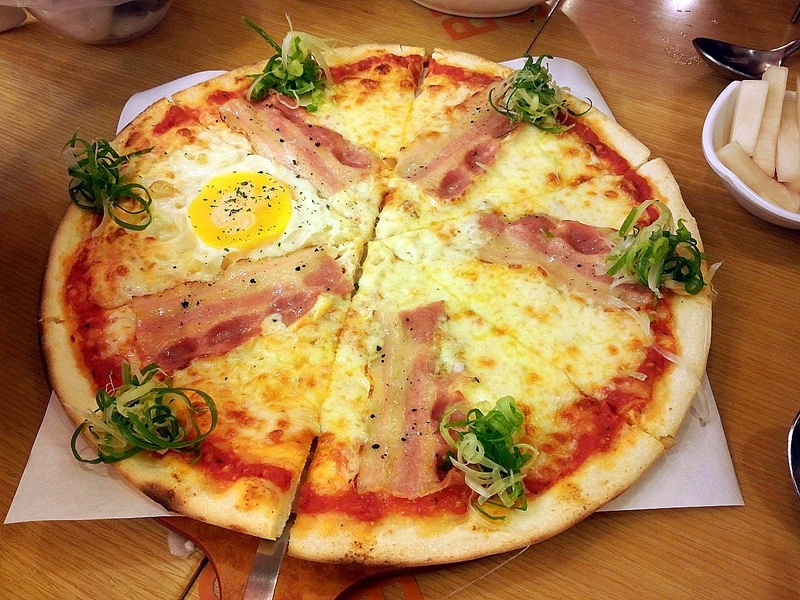 The set choice is most commonly ordered which pairs the Darling pizza, a Mabbong and a drink for 15,400. 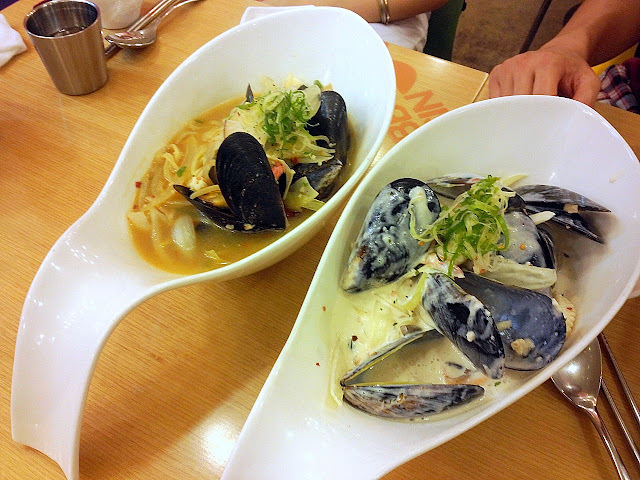 Coming out first was our Jiribbong and Baekbbong in two huge bowls, shaped as soup spoons. The Baekbbong sauce is creamy and cheesy, a little on the thicker side which I liked. It has a richer flavor than the countless other cream sauce based pasta served in so many Korean establishments. 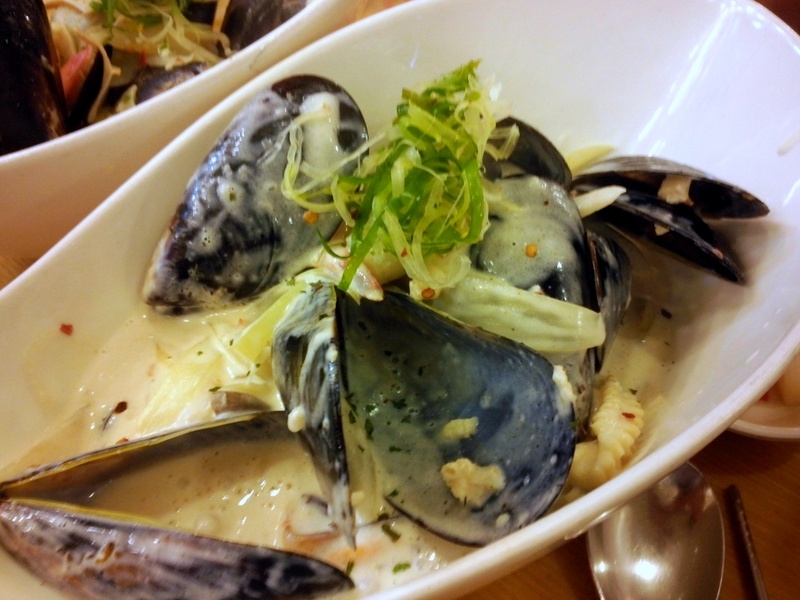 It coated well with the noodles and mussels to create a nice balance. The flakes of red pepper was a nice addition. The Jiribbong pleasantly surprised me. The broth has all the flavors of the vegetables and seafood that was stir fried in the wok but a nice and deep spicy kick akin to the Nagasaki Jjambbongs. In particular, the seafood in the dish were very fresh tasting including the mussels (which, I'm not always the biggest fan of). As I later saw while heading out on the signs on the walls, Bbonshin actually directly goes to the local seafood markets to purchase the mussels fresh everyday meaning the mussels going into the jjambbongs here are not only fresh but never frozen. The Bbongmark pizza was a decent size coming in at around 12" or so (maybe it was 10?) Cheese was generous and they didn't skimp out on the bacon either with each slice (except for the one with the egg) getting a bit of the pork belly. Taste-wise it was decent. Nothing to rave about but a better value than any other pizzas served in similar low-mid range restaurants. My letdown was with the egg however. The waitress explained before we ordered that we were supposed to crack the yolk and spread it around the pizza for a better taste but the egg was cooked too much for there to be any runny yolk. Oh wells. Bowls of rice or more noodles can be ordered for 1,000 won more each. Spicy levels can be accommodated for those who like it fiery and those who are spice averse. Bbongshin publicly makes a number of pledges which are found in signs in all of its stores including that all dishes are made to order and with fresh ingredients. Overall, Bbongshin definitely exceeded my expectations both in taste and quality. The place really shines on value especially in consideration of the many mid-tier eateries which often chooses to either sacrifice price or quality or, at worst, both. Bbongshim isn't fancy eats but if you're looking for an above decent place to eat without having to spend too much or worry about what's in your food, Bbongshin is worth stopping by. Address: Many branches but the one I went was near Konkuk University. Other branches are found in Gangnam, Hongdae, Sillim, Hyehwa and more. Alcohol: Apparently some stores have draft Korean beer available but it doesn't seem every store does.